There are many factors which affect the value of your timber including its: species, size and quality. Factors such as terrain, logging distance, and the presence of streams and wetlands also influence the difficulty of the job and will affect the price. 1. Negotiated Price - A price is negotiated for the value of your timber. The price can be negotiated by yourself or by someone with a greater knowledge of timber prices representing your interests, such as a consulting forester. The price can be paid as a lump sum (i.e. one amount of money for your timber) or based on mill tally (i.e. your trees are cut, brought to the mill, and you are paid for the wood based on their measurement of the delivered logs). Negotiated prices are used most frequently when timber harvesters, timber buyers or industrial foresters buy timber directly from landowners. Consulting Foresters will also use negotiated sales when selling timber of marginal value or when particular equipment or expertise is needed. 2. Competitive Bid - The trees to be cut are marked in the woods with paint and at the same time the volume of the wood is estimated. A showing is organized in which multiple bidders visit your property and make bids on your wood. A competitive bid will determine the value of your wood in the open market and can give you the most money for your wood, especially for high quality timber. Competitive bids are used primarily by consulting foresters. You are legally responsible for making sure the harvest meets all relevant local and state laws such as the Forest Cutting Practices Act, Wetland Protection Act, and Endangered Species Act. This means you need a clear understanding of pertinent laws or should work with someone you trust that can protect your interests. 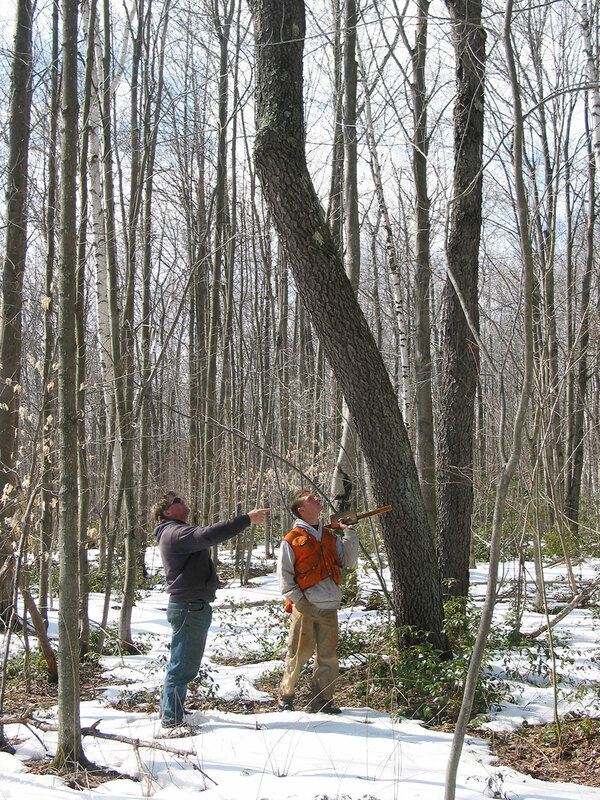 It should be noted that although the state service forester may periodically check on a job for compliance with state regulation, it is not their responsibility to supervise a job for you or to make sure it is in compliance with your individual contract. A good contract is a critical part of a successful job! A strong contract with the important elements that represents your interests will make sure your goals and legal obligations are met. Common Elements of a Contract. A performance bond can be issued at the start of the job as assurance that contract provisions will be met. Should the contract not be fulfilled, the landowner has the means to address the deficiencies, such as hiring a bull dozer to smooth ruts or grade the roads. Click here for next step > "Choosing someone to work with"